As a marketer, it’s often that I’m in the situation where I learn what I need to know from websites, images, blog posts and occasionally books, but it’s not very often that I come across the opportunity to be there when the surveyors carry out their work, so this was a great chance to learn more about what they do for Formby Surveys and the types of environments they work in. Yesterday saw me going out on-site, scanning one of the three remaining shot towers in the UK. Chester Shot Tower, also known as Boughton Shot Tower, which opened in 1799, is a grade-II listed building, located next to the Shropshire Union Canal and is part of the disused Chester Leadworks. Standing 41m tall, the tower was designed so that molten lead could be poured through a sieve at the top of the tower, allowing droplets to fall to the bottom, forming perfect spheres, created by surface tension on the descent. The shots produced in the tower were used in muskets in the Napoleonic Wars and was used to create shot until late 2001. Anyway, more about why we were there… We were scanning the tower because we were asked by a client to determine the thickness the tower’s walls, whether the thickness increased or decreased going up the tower. 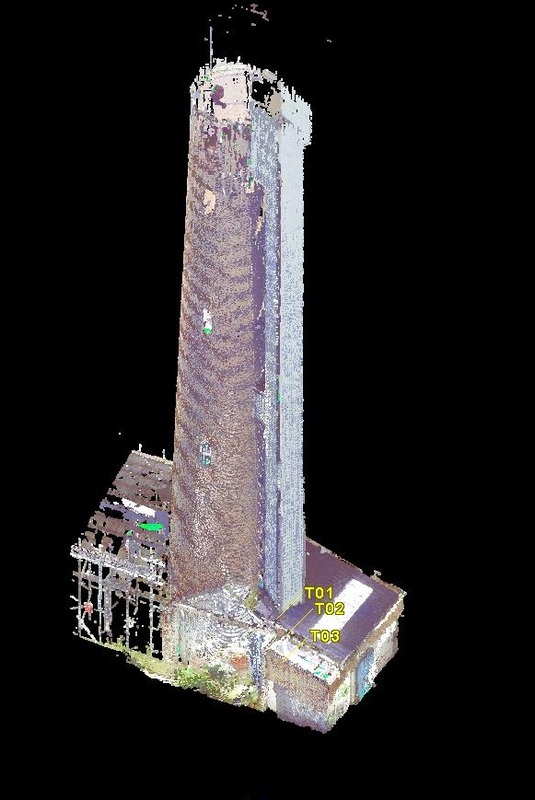 To determine the thickness of the tower’s walls we created a point cloud of the interior and the exterior of the tower. To do this, we needed to scan not only from floor level, we also needed to scan from elevated positions inside the tower. Getting the scanner to a height inside of the tower was easier said than done, as the lift on the side of the building was no longer in use. To complete the scan we had to use a heavy duty pneumatic telescopic mast. 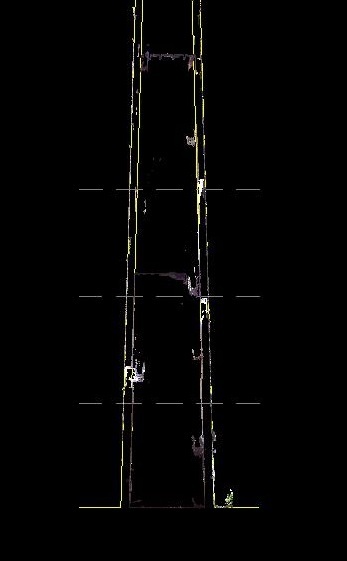 After attaching our FARO 3D Laser Scanner to the top of the mast, we raised the scan platform to a height of 12m the inside the tower, which enabled the scanner to scan the higher internal areas of the tower. Now that the scans of the tower have been completed, we can work on registering the scans to form a point cloud, which will enable us to determine the thickness of the tower walls by slicing horizontal sections through the tower at predetermined, regular intervals. We’ll post another blog update once we have completed the project, hopefully with some pictures. Talking about pictures… Here’s one from yesterday! Being out on site with our surveyor is something that I hadn’t done before, but will certainly be doing again. Before going on site, I had minimal understanding of what our surveyors do when it comes to 3D Laser Scanning; what they did with the survey control and how to set up a tripod, but it’s given me a real insight in to exactly what goes on. I’ll certainly be going out on site with the surveyors in the future.